In a move we knew was coming in the very first week of September has now made the news cycle rounds day. According to a Reuters report, T-Mobile has made the decision not to sell any BlackBerry devices in their company-owned retail store locations. I’m honestly not sure why the store is breaking today when company management began filtering this message down earlier in the month. That being said, it’s an unfortunate move for the once mighty BlackBerry and we expect that other carriers may follow suit in the near future. While the news broke on September 3rd that this was going down, it wasn’t until today that a T-Mobile executive “officially confirmed” the move. David Carey, T-Mobile executive vice president for corporate services told Reuters that “keeping stock in the retail distribution system was inefficient” as supply far outpaced demand. Carey said that most of the company’s BlackBerry purchases were by companies that do not purchase devices in retail stores. Therefore we will display and sell it in the store for those consumers who would like to see one,” he added. One more proverbial nail in BlackBerry’s coffin. Thar she blows! Article-ho! We all thought this was your date night or something, Dave. About the topic… I think this is probably a good move on blackberrys part. Email, push messages, and business catering is all blackberry has had so just stick with it. The fanboys have spoken… No one wants one for personal use. Stick with businesses. Maybe all their spare cash funneled into just that focus might sustain them for a while. I’d hate for more people to lose jobs. I’m been laid off for the cellular industry before and other IT jobs. It’s an extremely volatile industry with major change monthly. Its tough out there folks! Good luck to all! I wasn’t even going to bother posting it, I tweeted about it earlier because we knew this was happening weeks ago. I still don’t know why this is news when store reps confirmed it in the beginning of the month. In other news, two Alcatel phones(Fierce and One Touch). Engadget has the prices and that they’re being released next month on T-mobile. I think that you did well to post it, David. It is news directly related to T-Mobile and other blogs were reporting on this. Also, there was an “argument” on CrackBerry as to whether or not the earlier reports were true. Some posters called some of the stores that other posters said were removing BlackBerry devices from their inventory and were told that this wasn’t true. An official announcement is never a waste of time. what a waste of shelf space. I would hope Tmo got some fat check from RIM to stock these paperweights. Sad, sometimes I feel like one of the few people in America using a Z10. Oh well, no waiting in line for a Z30 and I will just order offline I guess. Blackberry will return with android in tow. It just means if you want to go into a store and see one first hand before purchasing one then the demo models will be there. If you want to buy one they can process the order and ship you the device. Wow. This is really sad. I worked in a Upscale store where BB outsold any other phone 3-1…Until the G-1 came out.Then that scale started to go the other way. I think BB should’ve snatched up WebOS while HP was selling it. Them or MS, I think WebOS could’ve helped MS even more. I really hope they carry the Z30 when released. If not I’ll buy them online on ebay or amazon. And also cancel my insurance since they won’t cover them for all my lines. Making space for units that actually sell I see. Owned a z10 for three months switched back to android. Amazing ui, really rooted for them but to little to late. Sad. I did the EXACT same thing. I loved the UI, but, without some critical apps, it just wasn’t going to make it for me. I sold it while I could still get some good money for it, and sit waiting patiently with my HTC MyTouch4G for the next phone that piques my interest. Maybe BB could have kept the market share had they created a large touch screen mobile a long time ago. Instead they relied on their name to keep them going. BB must have IBM relics working for them. Anyhoo, I am glad Tmobile is trimming their inventory. Unfortunately, Tmobile don’t seem to keep their hot selling mobiles in stock, and rely on the reps to sell the customer a different model, than what the customer actually came into the store to purchase. Tmobile really needs to watch trends and their inventory, and restock asap where demand is happening. Overnighting if needed, or 2nd day shipmemts to stores is possible. Maybe Tmobile has too much red tape execs to simply refill a simple mobile at a store, that isn’t showing sales, because they never had the stock in the first place to sell it. As a rep we are not told to sell other than what we have. We sell to what the customer wants, if it is not in stock then we have it shipped to their home. The only way a phone with an os other than android and ios can actually compete with android and Apple is if it is based on one of those two. Due to the following and the number of apps that are compatible with them. With Apple it won’t happen, but with android it’s open source so any company can create a build based off of it and put it on there phone. Like CyanogenMod and chameleon os. Well it seems that WP8 is doing the job, they have seen constant growth. I guess it all depends on the regional stores, but here in South Texas, the BB started to loose shelve space. Rather than being prominently displayed, there were bumped in a corner or behind the sales reps.
No one meets the communication needs of business like Blackberry. I typically order phones for my employees through an account executive but like the option of going to a store. If Tmobile drops Blackberry in store I will take my corporate and family cellular accounts to ATT. Idiots like you are the reason why they are taking it out of stores…goof ball! with windows,or Android, or why not both. Either way it is sad. any TM rep heard if they will. Who on earth would by a BB for the same price as a gs4. The only positive thing BB had was international roaming for $20 a month. This does not work on bb10. Typing on my gs4 with SwiftKey is 10x better than on the older blackberries. Internation texting is a big thing for some people. It is still most secure phone on the market. BB is still King in Asia because of this. I would agree with you though, Price point is too high for this device. Sad day for Blackberry. Just saw their latest earnings report and it was a bad one. Apple sold almost twice as many iPhones in one weekend as Blackberry sold phones in a whole quarter. That’s news to me; I bought a brand new Q10 in a TMo store on September 28th! 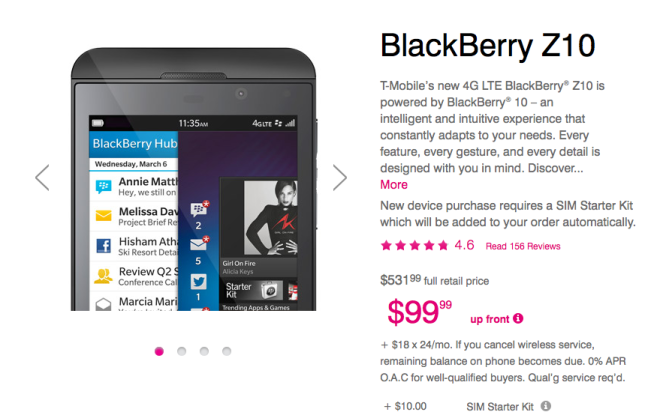 Well then, when is T-Mobile offering the Z10 with $0.00? I meant $0 down dollars.